Is The iPhone Losing Out In The Chinese Market? : Parallels Although many of its phones are made in China, Apple has struggled with sales in the world's largest smartphone market. A cheaper iPhone may attract more consumers — but it could also lose some of its cachet. The company also faces competition from Asian rivals who offer cheaper phones. A woman looks at her phone in front of the Apple store in Shanghai. Apple unveiled a cheaper version of the iPhone on Tuesday. Earlier this year, Apple CEO Tim Cook was talking about the relatively poor sales of his products in China. "In the arc of time, China is a huge opportunity for Apple and I don't get discouraged over a 90-day kind of cycle," he said while discussing his company's third-quarter results. "In the first quarter of this year, Apple ranked top in Hong Kong with 46 percent market share in smartphones, though that was down from 54 percent in the last quarter of 2012, according to market research firm Canalys. "Even without releasing a new product, Apple sold 31.2 million iPhones in its fiscal third quarter, around a fifth more than analysts had predicted. 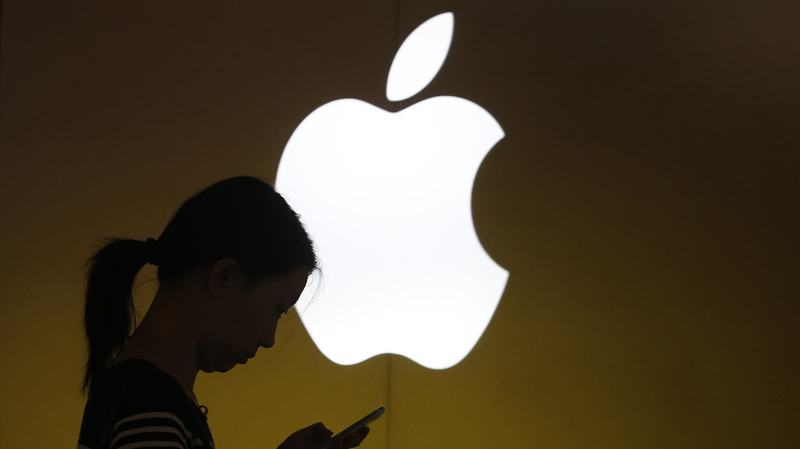 But revenue from all Apple products in Greater China, which includes Hong Kong and Taiwan, slumped 43 percent from the previous quarter and was down 14 percent from a year earlier — worrying in a region where smartphone penetration is still low. "Greater China accounted for 13 percent of Apple's sales, or $5 billion, in April-June — down from nearly 19 percent in the previous quarter." The news agency noted that Apple faces competition from companies such as Xiaomi and Vivo, as well as Samsung, its major global rival. But it's unclear if a cheaper iPhone could have an impact in China. As Marketplace notes, "the one thing Apple has going for it in China is cachet." "One of the golden rules of marketing in China is that anything displayed in public can command a huge price premium," Tom Doctoroff, Asia Pacific CEO of ad agency JWT, tells Marketplace. "And the reason for that is status is a primary driver here, much, much more so than in the West. "So when you offer an inexpensive iPhone, it immediately signals that this isn't so elite anymore." Still, China — the world's largest smartphone market — offers a promising market for Apple, as NPR's Steve Henn noted: "Next year, analysts expect Chinese consumers to buy 235 million new smartphones — that's twice as many as Americans are likely to buy." "Though Apple and Samsung ... might contest the originality of Xiaomi's vision, they cannot deny Xiaomi's distinct price advantage: while the flagship MiPhone 3 is just under three hundred and fifty dollars, the company's extremely popular Hongmi is just a hundred and thirty dollars. This is a fraction of the cost of the nearly eight-hundred-dollar iPhone 5 or the nearly five-hundred-dollar Samsung Galaxy. It practically vanishes from store shelves whenever it appears. "But Xiaomi's affordability is only one factor that has drawn such a loyal fan base among China's youth; another is that the company is the embodiment of the new, rising China." Last week, Xiaomi unveiled its new $327 smartphone, and as Forbes pointed out, fans began lining up at 11 a.m. for the event — something Apple's familiar with as it unveiled its new products Tuesday.